Leah Panos — Laguna Beach Live! Leah Panos is a Harpist. She earned her Bachelor’s Degree in Music Performance at San Diego State University where she received the Outstanding Graduate Award in 2006, and continues to serve as an Artist-in-Residence at SDSU. Leah is an active musician in the San Diego area and she has performed and toured with university and community orchestras, church orchestras, chamber ensembles, local theater productions, and wind ensembles throughout Southern California. 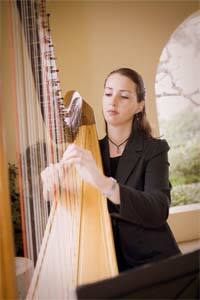 Leah is an active musician in the San Diego area, performing regularly at recitals, weddings, receptions, hotels, educational outreach programs, and formal events, as well as teaching harp students. She has performed and toured with university and community orchestras, church orchestras, chamber ensembles, local theater productions, and wind ensembles throughout Southern California. In addition to guest performances with various performing groups in San Diego, Leah appeared with her harp on television in a 2002 KPBS Christmas special. As of 2008, Leah has been seen performing in musical theater productions with Lamb’s Players Theater in Coronado, and was a featured soloist with the U.S. Marine Band in San Diego. Her solo repertoire is vast, with special emphasis in the Classical, Romantic, and 20th Century periods, and has composed several harp arrangements of pop and film music. You can visit Leah Pano's website to listen to samples of her music.